A fake beggar, Abdullahi Abbas, who was apprehended in Ikorodu area of Lagos State yesterday, told a mob that he makes between N5,500 and N8,000 daily. Abdullahi, 37, usually disguised as a visually impaired beggar, led by a 12-year-old boy (names withheld) begging for alms at First Gate and Odogunyan area of Ikorodu. Luck, however, ran out on them as a curious female resident, Adeoye Baliks, who engaged the pair in a conversation, discovered the ruse. Abdullahi and his aid were said to be well patronised in the axis until the curious resident raised the alarm. According to an eyewitness account, both were said to have confessed they realised between N5,500 and N8,000 daily, depending on the patronage. Vanguard learned that after several beatings, Abdulahi was said to have traced his origin to Oyo State, saying he belonged to a team of beggars, who feigned visual impairment and operate in areas like Ikorodu, Oshodi, Iyana-ipaja and Abule-Egba. 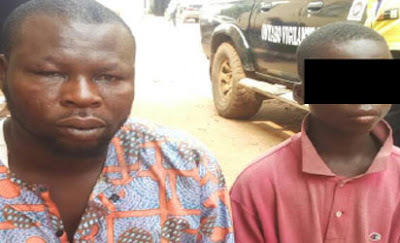 A resident, simply identified as David Oyesile, said both were found with a bag containing an undisclosed amount of money and it was learned that a substance was usually rubbed on Abdulahi’s face as he uses a walking stick, led by the teenager. The scene attracted a huge crowd, who almost took the law into their hands but for the timely arrival of a local vigilante team in Ikorodu, Onyabo Vigilante Group, who prevented a mob action and handed over the pair to Police at Sagamu Road Division.